The start of the new academic year has seen the appointment of the twenty third Headmaster at Merchant Taylors’ Senior Boys’ School. David Wickes joins us from Warwick School where he worked as Deputy Headmaster. Mr Wickes has a rich academic background and holds a degree in Modern History from Oxford University as well as an MA in War Studies from King’s College, London. He began his teaching career at Dulwich College in 1997 and has more than twenty years’ extensive experience of working in the independent education sector. He left Dulwich for Abingdon School, in Oxfordshire, in 2008 where he was appointed Upper Master and taught history and sport, before joining Warwick School in 2013. 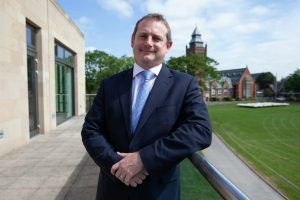 Talking about his new role, David, said: “It is a real honour to have been appointed Headmaster at such an exciting time in Merchant Taylors’ history, with its 400-year anniversary milestone just a few years away. It is one of the most prestigious independent schools in the North West with an enviable reputation to match. As well as his academic successes, David has coached rugby to a high standard including being Backs Coach for the England Under 16s team from 2007 to 2013. Founded in 1620, MTBS is a leading North West independent school for boys aged 11-18. This year, we enjoyed fantastic A Level results, being the top performing boys’ school in Sefton, with one in five boys achieving A* and one in ten boys gaining places at Oxbridge.